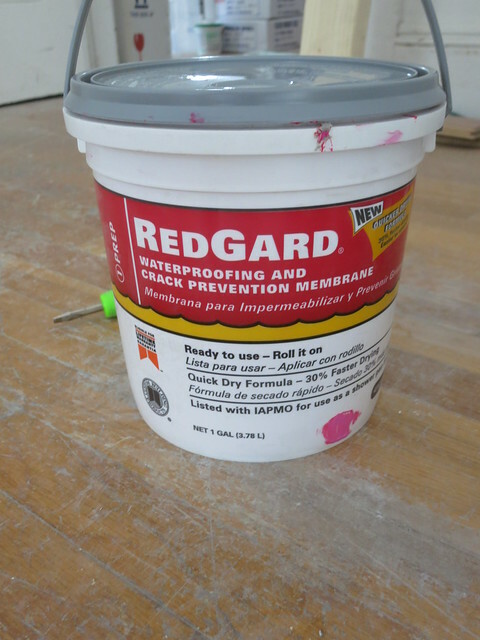 Red Guard is a product from Home Depot that is a paint-on waterproofer. It’s a little pricey but is pretty easy to use. The first step is to paint all the seams to get a nice foundation. To apply, use a cheap-o (but not so bad it will fall apart) brush and go to town. 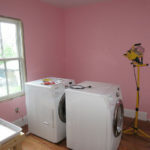 It’s a goopy product and it comes out of the bucket hot pink but dries to a nice red color. 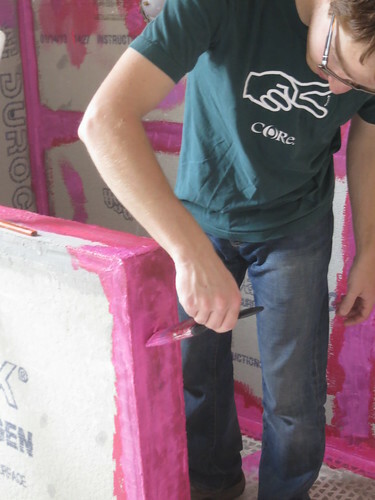 One recommendation we read online was to use fiberglass to reinforce the crack-prone areas. We cut a strip the appropriate length and worked it into the wet redguard along the back edge of the shower where we have some concerns about leaking since the shower pan and the wall don’t fit tightly. We push it in with a scraper and redguard over it. Once it’s dry there will be a nice reinforced corner where there was once a trouble area. Once the seams were dry, we’ll rolled on 2 coats of the redguard. 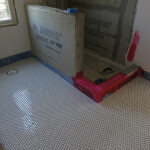 Once the final coat had turned red, it is time to tile. can’t help but notice that kerdi shower pan doesn’t look right. 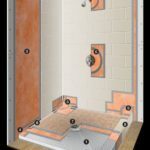 did you watch the install video from schluter? they don’t use redguard they use kerdi to cover the pan. and the seams at the bottom edge of the pan. 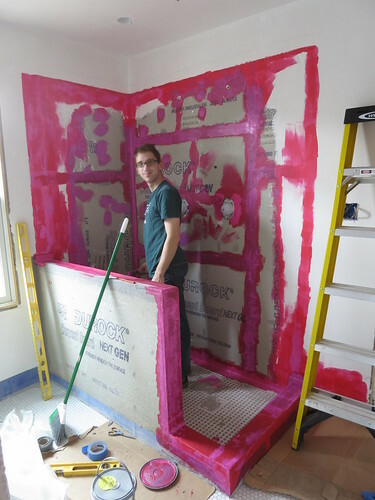 a 2″ overlap is required and to test you should do a water test on the shower pan. Yep, we aren’t using the Kerdi system but just the kerdi pan. The pan gives us the correct slopes and a nice stable underlayment. Then we just painted the red-guard on top to seal everything up. It is extremely stable and water-tight but it is a bit of a home-brew method rather than using the complete Kerdi system. The red-guard with the Kerdi pan underneath has worked great for us. 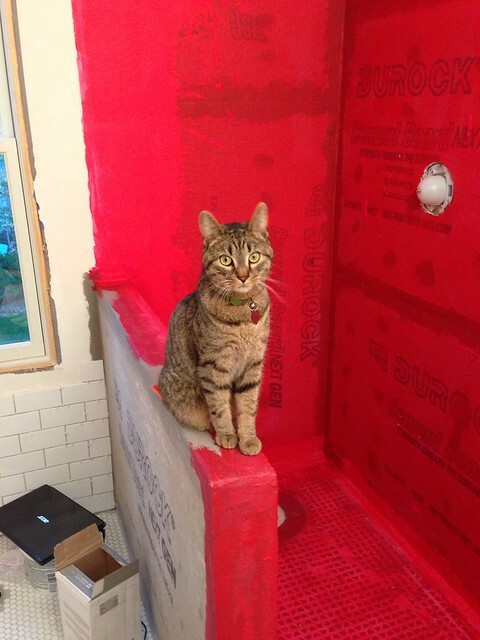 Yes, mixing waterproofing systems is not advisable – can lose warranties, etc. We chose the Schluter Off-Center preformed pan because it fit perfectly in our space. 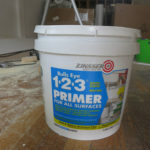 We originally looked at Lacticrete’s pre-formed pans, but they cost 3x as much as Schluter’s. We originally planned to use Lacticrete’s Hydro-Ban waterproofing product, but ran out of time to order it, and read how Red Guard is comparable (maybe slightly inferior), but is available at Home Depot. I see it has been a few years since you did this waterproofing and would be interested to know how it turned out! [WORDPRESS HASHCASH] The comment’s server IP (202.105.63.45) doesn’t match the comment’s URL host IP (74.125.224.203) and so is spam.